Billy Frank Jr., who led the Northwest into the modern era of protecting salmon and tribal fishing rights, died Monday morning at age 83. 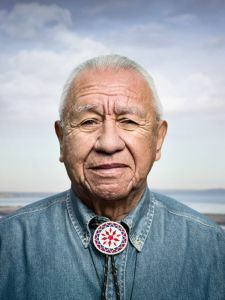 Frank was an early leader in the protest movement, leading fish-ins and fighting the court cases that led to the 1974 Boldt decision, the ruling that recognized tribal rights to salmon. While untiringly committed to science and legal causes, he was known for his humor, warmth and optimism. Mark Trahant, the former Seattle Post-Intelligencer editorial page editor, wrote on Facebook: "Because of Billy Frank Jr., the salmon survive today and have returned to streams where they were once extinct. And the tribal communities of the Northwest are stronger in so many ways." He had chaired the Northwest Indian Fisheries Commission for decades. His latest blog post, "Keep Big Oil Out of Grays Harbor," is dated Monday; it reflects his passions for environmental protection and tribal involvement with the biggest issues of the day. For more on Billy Frank, Jr., read Trova Heffernan's biography of Frank in pdf version here -- free because it was sponsored by the Secretary of State's Legacy Washington project. "I don't believe in magic. I believe in the sun and the stars, the water, the tides, the floods, the owls, the hawks flying, the river running, the wind talking. They're measurements. They tell us how healthy things are. How healthy we are. Because we and they are the same. That's what I believe in. Those who learn to listen to the world that sustains them can hear the message brought forth by salmon."